Among a sea of electric pencil sharpeners, maybe you are looking for a small and light one to help you on the go. 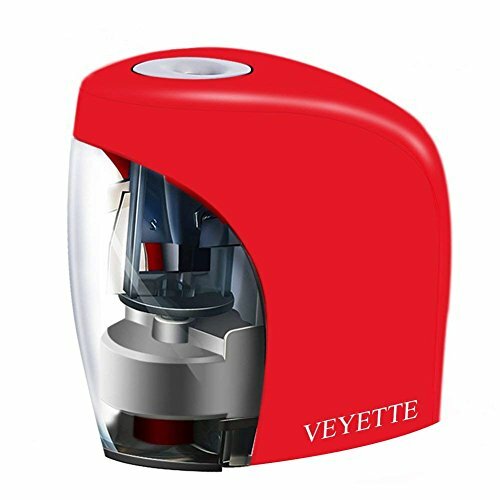 This newly released electric sharpener by Veyette may be the one you desire. You have to hold the pencil sharpener with one hand and your pencil with your another hand while sharpening pencils. Remove your hand pressure on the pencil, and it will stop working. This electric sharpener cannot be used to sharp crayons and eyebrow pencils. The blade is replaceable, but this item comes with only one blade, you need to buy an extra one if you want to replace the old. You need to clean the shavings container regularly to prevent malfunctioning. Please feel free to reach out to us anytime if you have any questions or concerns. We will always be here to help. You can also ask a question and get the answer in the column "Customer questions & answers". If you have any questions about this product by Veyette, contact us by completing and submitting the form below. If you are looking for a specif part number, please include it with your message.